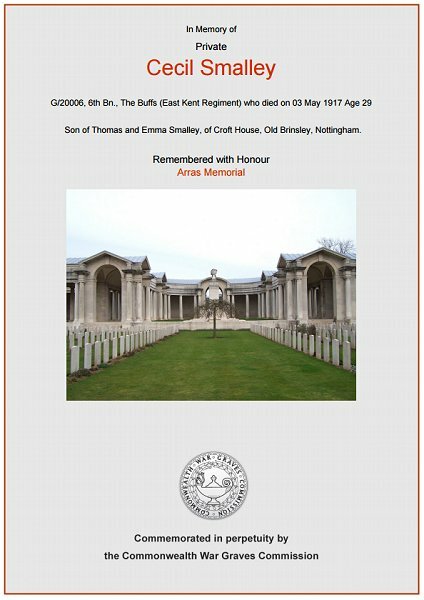 Cecil Smalley was born in 1888 at Brinsley, Nottinghamshire, the son of coal miner later colliery haulage contractor Thomas Smalley and Emma née Nunn. In the 1891 census Thomas and Emma were recorded at Greasley, Nottinghamshire, with their seven children - Jessie (b1881), Percy (b1883), Lillian (b1884), Jack (b1885), Agatha (b1887), Cecil, and Olive (b1890) - together with a 15-year old servant. The whole family were listed at Brinsley in 1901 and in 1911 Thomas and Emma, together with Lilian, Agatha, Olive and Cecil were still at Brinsley. Cecil, by this time aged 23, was working as a bank clerk. During 1915 Cecil moved to Yeovil where he worked as a junior clerk at the Yeovil branch of the London City & Midland Bank. Cecil enlisted in Yeovil, joining 6th (Service) Battalion, The Buffs (East Kent Regiment). The Buffs did not extend the regular number series of the 1st and 2nd Battalions to men joining its new service battalions. Those volunteers who enlisted for war-time service only, were issued with numbers from a new series which began at 1 and was prefixed with G/. Cecil's Service Number was G/20006, suggesting he enlisted during the autumn of 1916. Cecil, having joined his battalion at the front, would almost certainly have been involved in the fighting of the Arras Offensive. This was a major British offensive that took place between 9 April and 16 May 1917, and troops from the four corners of the British Empire attacked trenches held by the army of Imperial Germany to the east of the French city of Arras. As part of the Arras Offensive the 6th Battalion took an active part in the First Battle of the Scarpe (9 to 14 April 1917), the Second Battle of the Scarpe (23 to 24 April 1917) and the Battle of Arleux (28 to 29 April 1917). Immediately after these battles the 6th Battalion, The Buffs, fought in the Third Battle of the Scarpe, the last of the Battles of Arras, 1917, which opened on 3 May. The French had planned a heavy attack on Chemin des Dames to take place on the 5th and, in order to distract the attention of the enemy and hold his troops east of Arras, Sir Douglas Haig considerably extended his active front. While the Third and First Armies attacked from Fontaine-les-Croisilles to Fresnoy the Fifth Army was to launch a second attack upon the Hindenburg Line in the neighbourhood of Bullecourt - a total of over 16 miles. Zero hour was timed for 3:45am on 3 May 1917 and Cecil was killed in action during the attack. He was 29 years old. The Western Gazette, in its edition of 25 May 1917 reported "News has been received of the death of Private Cecil Smalley, of The Buffs, who was killed on the Western Front on May 3rd. Before he joined the Forces, the deceased resided in Yeovil for about 12 months, and was a junior clerk at the Yeovil branch of the London City & Midland Bank. He was a native of Old Brinsley, Notts." Cecil Smalley is remembered on Bay 2 of the Arras Memorial and his name is recorded on the Yeovil War Memorial in the Borough. The Commonwealth War Graves Commission certificate in memory of Cecil Smalley.